UltraAgent Oracle, his only hope. After Surefire’s case, UltraAgent Oracle takes time off from using her mind reading abilities—until a horrific transhuman crime forces her back on the job at UltraSecurity. 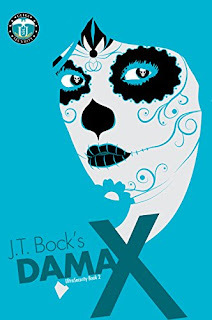 At the same time, an old promise forces UltraAgent Pax to confront a new villain on the scene—Dama X, a Mexican cartel leader with a gender-bending way of dispatching her enemies. As those close to them become victims, their cases entangle, and Oracle hides an uncontrolled power surge from her boss, Pax—her ex-boyfriend and the one man she secretly loves. If he learns about her unstable power, Pax will remove her from the most important case of her life, even if it means he may die. Super powers, romance, demi-gods, and unexpected twists follow UltraAgents Oracle and Pax as they travel to Mexico to solve a case that defies explanation.